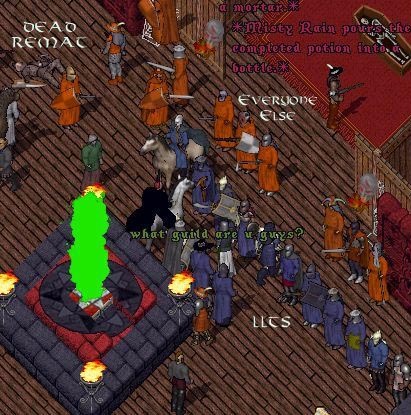 As 1999 drew to a close, OSI began to revamp its volunteer program and offer more quests and events to players. Elders run them for newer players. Seers for older veteran players. And GMs host large special occasions ones. One such large event was Halloween 1999. Guards in town turned a blind eye to the hoardes of undead monsters that crept from the bowels of the earth and overran them. Skara Brae was the site of a massive undead battle on Atlantic shard with many players gathering to fight the undead hoardes. Lag turned out to be the biggest killer of all and the Guards were the second largest for while they wouldnt kill guards, they would kill you if you accidently misclicked while targeting a monster in the lag. Since then a number of quests have popped up all over the world. And magic was even turned back on in some towns for a time to facilitate more quests. This led to town fighting being made obselete in those towns during that time and alot of pissed off players.